Billy Graham: "A Spiritual Gift to All"
Former presidents, from right, Bill Clinton, Jimmy Carter and George H.W. Bush, look on with Rev. 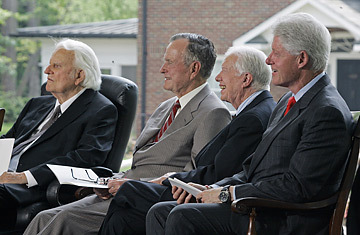 Billy Graham, left, during a dedication for the Billy Graham Library in Charlotte, N.C., Thursday, May 31, 2007. Under a blazing North Carolina sun, faith and power renewed their vows, as three former commanders in chief  Jimmy Carter, George Herbert Walker Bush and Bill Clinton  convened in Charlotte, N.C., to pay tribute to a man they all love. The occasion was the dedication of the Billy Graham library, modeled after the dairy farm where the evangelist grew up, with an immense cross as its doorway and an exhibit designed to soak visitors in the gospel message that Graham had preached to more people than any man who's ever lived. But it was also an occasion to witness one last time the extraordinary private ministry to public men that set Graham apart from every other religious figure in American history. Graham was hardly the first preacher to have a White House pass; but he was the first to have one in 11 consecutive administrations, Democratic and Republican, led by men very different from each other who all somehow felt the need to have him by their side. You could almost feel the rest of them hovering protectively over the proceedings in Charlotte: Eisenhower, who asked Graham on his deathbed how you can know if you're going to heaven; Johnson, who invited Graham to the White House within weeks of taking office for an encounter that included both prayer and skinnydipping in the White House pool; even Nixon's ghost, come to honor the man he'd clearly loved, and deeply wounded. Bush, 83, gave the keynote address, and praised Graham for sparking a moral awakening in the U.S. and later, in communist countries. Graham, along with Pope John Paul, "helped tip the balance of history in freedom's favor." Bush also thanked Graham for ministering to four generations of his own family, starting with his mother and continuing through to his children and grandchildren. "Billy guided our kids, including our daughter Doro and the President, through their own spiritual journeys." Graham, said Bush, "is a spiritual gift to all of us," briefly choking up as he spoke. Graham had known so many of the first families for so many years that it was natural for him to evolve into a kind of informal White House Chaplain. Any man who regularly drew crowds in the hundreds of thousands, night after night in city after city, had come to learn painfully the price of celebrity. He could talk to them about their kids, their marriages, their doubts and questions, and the Presidents knew they wouldn't read about it in the Washington Post the next day. Churches can be highly political places; Graham was the pastor who made house calls. Clinton, 61, told the crowd of 1500 that "I am here because of the public Billy Graham and because of the private Billy Graham. When he prays with you in the Oval Office or upstairs at the White House, you feel he is praying for you. Not for the President." Clinton recalled going to Graham crusades in 1959, 1971, 1989 and 2005. "Billy has known me since 1985," he said. "But I have known him for nearly 50 years." Carter, also 83, praised Graham as a boundary-breaking preacher who had the greatest influence on his own spiritual life. Graham was the "first evangelist of any stature" who penetrated the Iron Curtain, starting with a crusade in Hungary in 1977 and eventually preaching four times in the Soviet Union. Concluded Carter, "I'm just one of tens of millions of people whose spiritual life has been shaped by Billy Graham." After all the testimonials, Graham took the stage and stole the show. "I feel like I've been attending my own funeral." Graham urged his audience to pray for Presidents no matter what they believe, saying all Presidents needed wisdom. He spoke of his love for Clinton and Carter as well, his "longtime friends. I love them all, regardless of politics and regardless of who stands for what." If Graham's spiritual message was always consistent, a message of gospel love and Jesus's saving grace, his political message changed profoundly. There had been a time where he didn't hesitate to speak out on the issues of the day, on foreign policy, the economy, court decisions. But he had come to see the cost of discussing the issues that divide people. Jerry Falwell's death brought many reminders of what happens when preachers take sides; long ago, Graham had decided to go down a different road. He had gotten way too deeply involved in his friends' campaigns, and he resolved to try and stop diving in. Ten days before his good friend Ronald Reagan was sworn in, Graham told Parade Magazine that "evangelicals can't be closely identified with any particular party or person. We have to stand in the middle, to preach to all the people, right and left. I haven't been faithful to my own advice in the past. I will in the future." You can hear that attitude echo now, decades later, when leaders at the National Association of Evangelicals circulate a letter on global warming and "creation care" as a moral imperative, or when megapastor Rick Warren addresses AIDS and poverty as moral issues, and says, when it comes to politics, "I'm not left wing, I'm not right wing, I'm for the whole bird." Warren cites Graham as his mentor; he has absorbed the lessons that reflected Graham's unprecedented and sometimes painful journey through the inner rings of power. There is a reason why, even now as he resides in peaceful twilight on his mountaintop in Montreat, North Carolina, Graham remains the leader evangelicals say they admire most. And the one Presidents trusted best. Gibbs' and Duffy's book, The Preacher and the Presidents: Billy Graham in the White House, will be published in August.